Things start in a cantina. We know this by the crazy collection of weird aliens and all the noises you know and love. 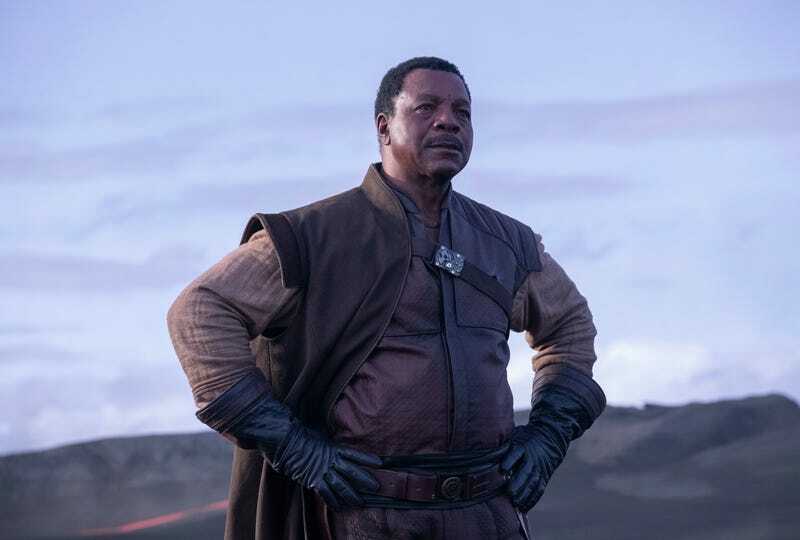 Cut to a table and on one end is Greef, played by Carl Weathers, and the other, The Mandalorian, played by Pedro Pascal. The Mandalorian does not take his mask off in any of these scenes. A gonk droid greets him at the door. He follows it slowly as it gonks away. It’s a dark hallway with those long Star Wars lights in a few places here and there. The hallway leads to a door. When it opens, it’s filled with Stormtroopers. They look dirty and and rundown. At a table in the center of the room is, what appears to be, their leader. A man played by Werner Herzog. Herzog’s character says Greef told him he was the best bounty hunter in this parcec and very expensive. As they’re talking, a door opens. In walks a man played by Omid Abtahi. Out of instinct and surprise, the Mando pulls his gun on the man, who he’s told is a scientist and not a threat. Even so, the Mando keeps his guns up, because all the Stormtroopers have also pulled on him and say he won’t put his guns down until they do. “We have you four to one,” says one of the troopers. “I like those odds,” says the Mando. Finally, everyone puts down their weapons, the scientist relaxes, and the Mando sits down. Herzog’s character puts an orange cloth on the table and reveals a piece of beskar, the material of the Mandalorians. Everyone is very impressed. “Go ahead, it’s real” says Herzog’s character. He adds that’s just a down-payment and there’s much more if he brings the mark in alive. However, Herzog’s character adds, he understand bounty hunting can be hard and would accept proof of termination for a lower overall fee. “That’s not what we agreed upon,” says the scientist. “I’m just bring pragmatic,” says Herzog’s character. The Mandalorian accepts the deal and asks what information he has. He doesn’t have a puck on this being but has a tracking FOB and four digits of an eight digit ID number. Which, considering it’s 50 years old, is apparently still impressive. It was unclear why. Herzog’s character can also provide the mark’s last reported position which, he suggests, in tandem with the other information, should be more than enough for a man of his talents to complete the task. 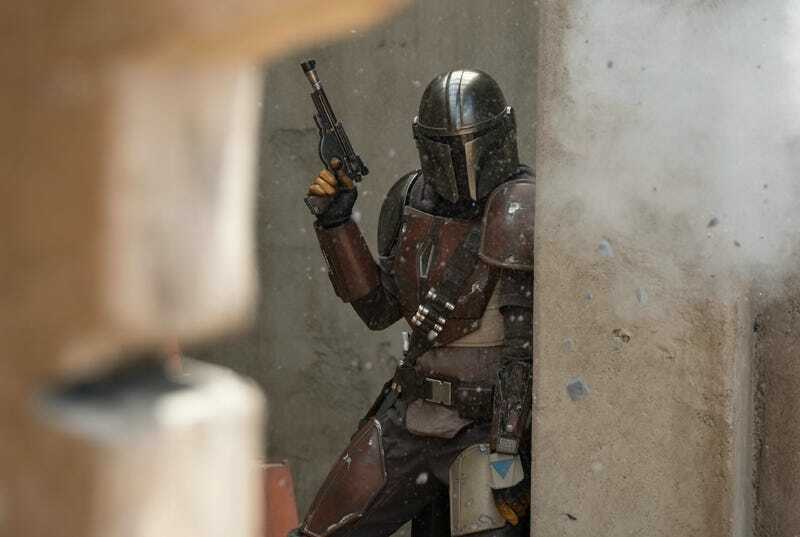 “It’s good for beskar to be back in the hands of a Mandalorian,” says Herzog’s character. “It’s nice to restore things after a period of disarray.” The Mandalorian exits. Now it’s trailer time. We see the Mandalorian’s ship, the Razorcrest, flying across the sky. 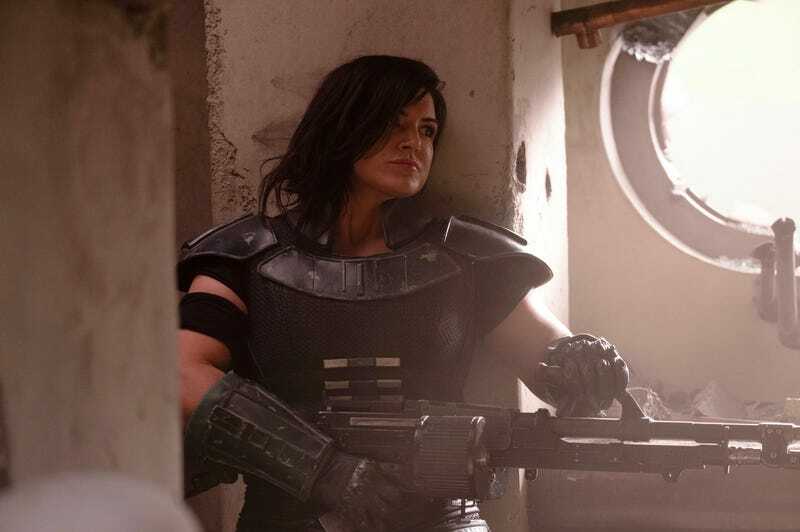 In a cantina (there are a lot of cantina’s in this show, apparently), the Mando sees Cara Dune, played by Gina Carano. “What’s her business here?” he asks. The two fight in hand-to-hand combat outside, before falling on the ground and both pulling guns on each other simultaneously. Over that plays this footage. A character played by Giancarlo Esposito walks up. He’s a bad guy, you can tell. He’s with a bunch of different Stormtroopers. “Burn them out,” he says, as a trooper with a flamethrower goes to town burning something with dozens of other troopers laying on the ground dead. Inside another cantina (like I said, lots of cantinas) there are a slew of different aliens: twi’leks, jawas, a devaronian, etc. Outside, an IG-88 droid is in the street spinning and killing a bunch of troopers. A new character played by comedian Bill Burr, holding two blasters, with a shaved head, fires in a green-lit space ship. Stanton’s character flys a TIE fighter, then, slow-motion of the Mandalorian hitting a Stormtrooper in the mask and the mask crashing under the pressure. Finally, a medium shot of him standing, picking up his staff which is also a gun, and pointing. 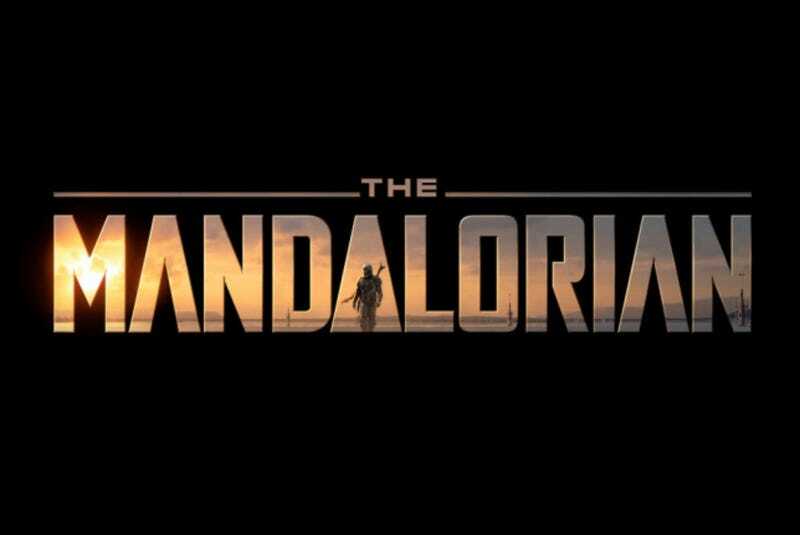 Then the title: The Mandalorian. Earlier was behind the scenes footage, which gave even more context. Over a black screen you hear beeping. Beeping. The image fades up on a pair of feet walking on a desolate, dark snow planet. Think Hoth at night with less accumulation. As the camera pans up, we see it’s The Mandalorian holding a tracking device. Things pull back and he’s walking into John Carpenter’s The Thing. The doors to a place swing open and we see him in silhouette. This is some kind of bar with new aliens. The Lucasfilm logo appears. As this is a behind the scenes trailer, there are a lot of talking heads explaining the world as we see all kinds of concept art and stuff. One piece is what appears to be a Mandalorian on a dewback. Another is Him talking with other mandalorians. A cantina. A busted TIE Fighter. An overhead view of the aforementioned snow area and it looks like a huge asterix of city dug into a mountain range. There are jawas. A sandcrawler. Speeder-bikes. New aliens running with guns on like a swampy, but bright, planet. The Mandalorian firing a stand-up cannon. Then Greef standing with three other bounty hunters looking at something approaching them. All of that was also edited with footage of the impressive list of directors and them talking about how excited they are for the show, and posing for photos. And, guess what? We were impressed too. The footage not just looked great, it looked cinematic and very, very Star Wars. November 12th can’t come soon enough.